A “skid car” — a Ford Focus equipped with hydraulics to provide less traction for the rear wheels — drives on a course set up in the parking lot of A.D. Farrow in Sunbury on April 17. A local driving school put on a demonstration of car control drills in Sunbury on April 17 to bring awareness to the problem of teen driver fatalities in Delaware County. 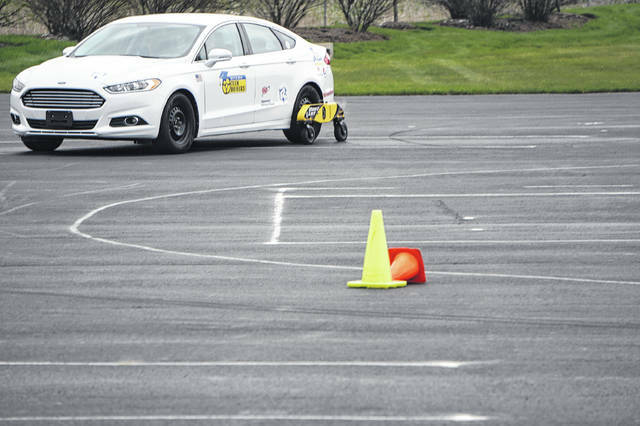 Amid flurries in two sessions, drivers tooled around the parking lot of A.D. Farrow Harley-Davidson, driving between cones in their own vehicles; and then sliding around in a specially-equipped Ford Focus used for teaching how to control a skid. David A. Hejmanowski, judge of the Probate/Juvenile Division of the Delaware County Court of Common Pleas, said he has assigned the BOTD course to second- and third-time teen traffic offenders for nearly 10 years. “We ought to have everyone do this,” he said. Mark Bloom, a former race car driver who competed in events such as the Columbus 500, is the founder and president of Better Ohio Teen Drivers. “It’s not about going fast, it’s about control, connecting, and being one with the car,” Bloom said of his instruction. Those who attended the demonstration got a crash-course in driving safety before trying their hand at the drills. Bloom added the three causes of crashes are mechanical (4 percent), road conditions (11 percent) and driver error (85 percent). The leading cause of death for new teen drivers is loss of control, from going too fast and/or being distracted. Those distractions include having teen passengers and texting. He recounted his own near-miss, going through a red light at 50 miles per hour while on a cell phone. Bloom explained that if you are multi-tasking, say texting and driving, your mind will focus on the more ingrained skill, the texting, and you will be less focused on driving. In addition, the front part of the brain, which is responsible for judgment, decision-making and impulse control, is still developing well into a person’s 20s. A news account of an accident victim was read where the driver’s severed arm was found away from the crash scene, still clutching a cell phone. “There’s nothing going on in your life that’s worth these stories,” Bloom said. The idea of the demonstration came from a meeting earlier this year with superintendents Mark Raiff (Olentangy Local Schools) and Andrew Miller (Buckeye Valley Local Schools). Participant Elizabeth Charles, who said she has three children in the Big Walnut School District, took the course and was seen taking part in the drills.